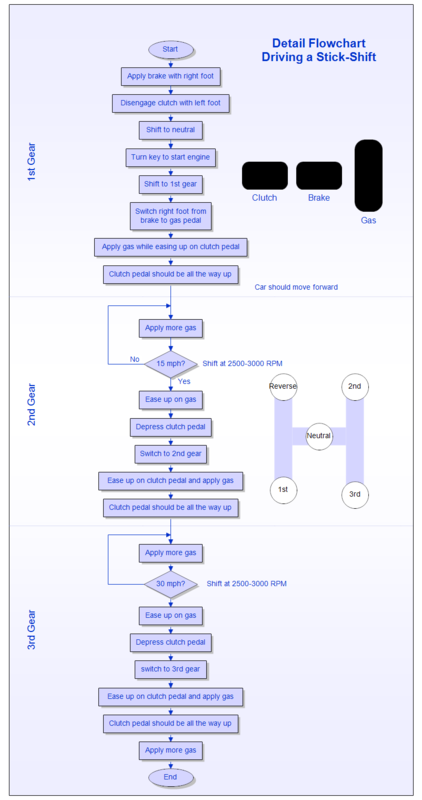 Description The chart above is a detailed flowchart that describes driving a car with a manual clutch. It gives each step needed to shift through the gears. While basic flowcharts show only the major steps, detailed flowcharts include more information. The designer of a flowchart must decide how much detail is required. Each flowchart has clear starting and ending points. The arrows show the direction of flow. Once a flowchart is drawn that accurately represents a process, then the process can be analyzed to eliminate inefficiencies. Once RFFlow is installed, you can open the above chart in RFFlow by clicking on stick_shift_flowchart.flo. From there you can zoom in, edit, and print this sample chart. It is often easier to modify an existing chart than to draw it from scratch. To draw this chart without downloading it, run RFFlow and use the Sample Stencil. You can right-click on each shape you are going to use, choose Properties, Line and Color tab, and fill them with a light blue color. You can draw a flowchart faster if you set up your stencils first.